With the occasion of the International Sculpture Quadrennial “Riga 2012: Anatomy of Integration,” newly commissioned art-objects were supposed to be installed on October 5th around the Freedom Monument and the Victory Monument in the city. However, these new works were never exhibited at those sites. The Quadrennial takes place every 4 years and has already a 40-year long tradition in the city, since the Soviet era, when the three Baltic Republics decided to coordinate their artistic efforts. Since then, the Painting Quadrennial has been taking place in Vilnius, Graphics in Tallinn and Sculpture in Latvia. For the 2012 Riga edition, 32 artists and sculptors from 15 countries were invited. All the participants are renowned not only in their home countries but also around the world, having been exhibited at the Venice Biennale, the Biennale of San Paulo and other major international art events. This year’s Quadrennial is devoted to the the analysis and determination of the current interrelationship between various cultural zones. This theme is topical in a lot of countries in the region on a socio-economic level. This is a positive provocation, which the organizers imagined would lead to reflection, discussions and the development of a progressive democratic society. At the same time, the organizers complained about strict censorship, blaming Riga’s City Council for imposing a ban on critical art. They claimed that three special installations for the Quadrennial were censored and could not be shown in their original locations. Why exactly did this happen? Sculptor and co-curator of Riga 2012: Anatomy of Integration, Aigars Bikše thinks that the City Council went to great lengths to protect its citizens from so-called “ambiguous” art objects, which may be disturbing for some viewers. Bikše also noted that such measures reveal how the City Council handles people who are unable to think abstractly, referring to those who do not understand critical art objects and overwhelm their officials with complaints. What is it that is so controversial about these art-objects? 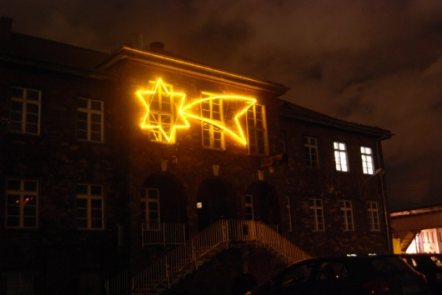 Polish sculptor Hubert Czerepok’s fluorescent installation entitled “Everything is Darkness,” combines the form of a Star of David with that of a comet. In his work “The Stage (For Political Integration), artist Stefanos Tsivopulous from the Netherlands comments on the recent re-election of Russian president Vladimir Putin. 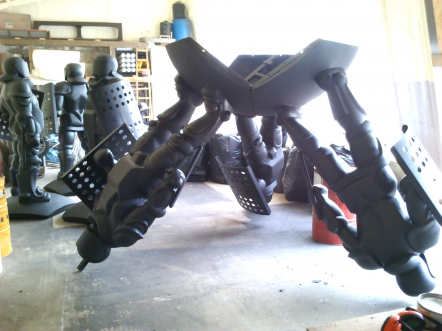 Latvian sculptor Ginters Krumholcs was supposed to participate at Riga with a sculpture representing soldiers in black armor standing on a black sphere. Entitled “The Name of the Rose,” this banned work symbolizes, according to the artist, “dark figures,” radicals who use acute “national issues” to exacerbate social problems and increase social divisions in Latvian society. He also explained that the “black sphere” is supposed to represent the confusion, aggression and even hostility between citizens. Last year, Krumholcs was nominated for the famous “Purvitis Award,” however this did not prevent his work from being censored in Riga this year. It seems that the theme of the Quadrennial – integration, around which so many harsh disputes are being waged today, is not welcome by the city’s authorities. 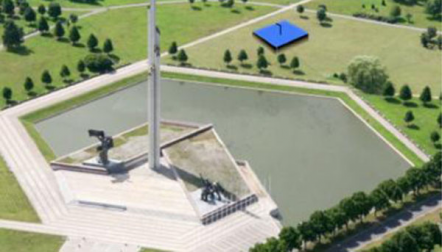 And the Star of David placed next to the Freedom Monument is totally unacceptable. Given the fact that the organizers were prevented from installing several works of art in the locations where they were intended to stand, they moved these to the Latvian Railway History Museum. Here they can be viewed by the general public until November 25th. This article originally appeared on MIX TV (Latvia) in Russian. This translation has been slightly edited for republication here.